Aloha, this article is dedicated to all of our readers that are wondering where to go for the best souvenir shopping on Maui. 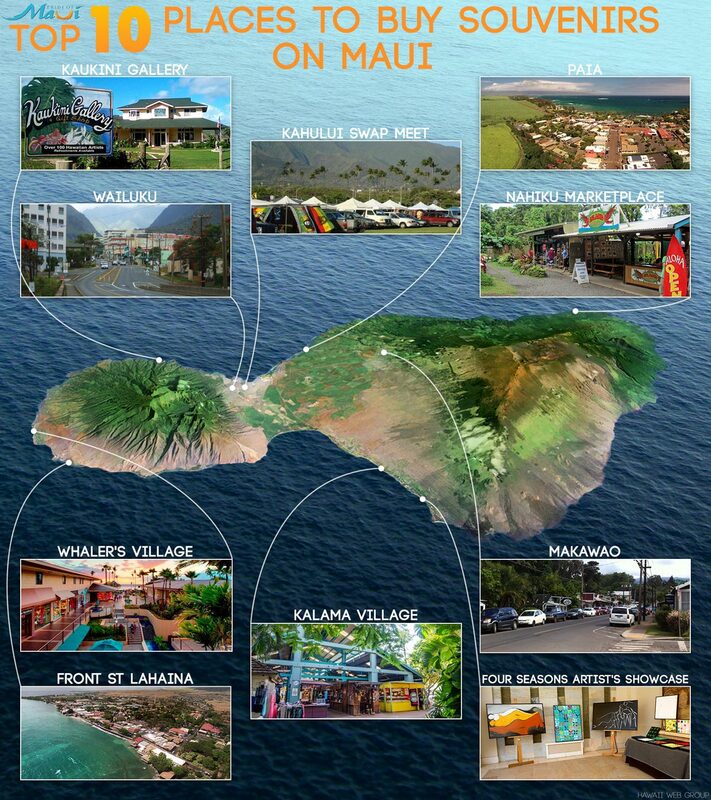 Initially, when planning your trip to Maui, you may not be concerned about where you’re going to be shopping. But, believe us, once you arrive on island and start enjoying all the amazing splendors that this island has to offer, you are going to love the idea of bringing gifts back to all of your friends and family! It is surely an amazing gift to bring your loved ones a piece of such an incredibly beautiful place on Earth! 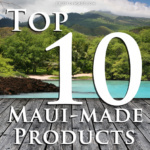 We have compiled the most recent in-the-know locations for buying Maui souvenirs. Whether you are looking for the regular Hawaiian-style tourist gifts or something with a little bit more soul, we’ve got you! 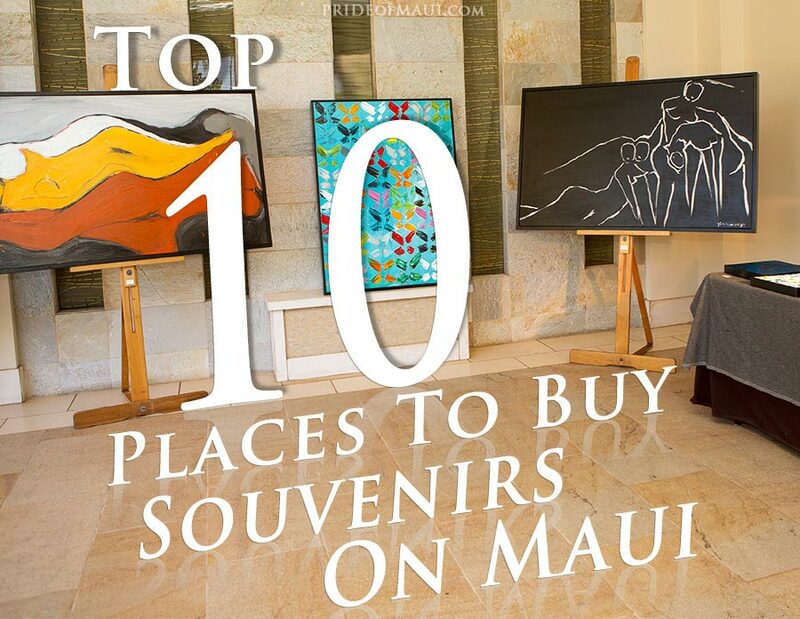 Below, you’ll find a list of the 10 Best Places To Buy Souvenirs On Maui. Although there are many individual locations to shop and peruse, this is a list of winners across several locations on Maui. No matter what, please make your visit to Maui the very best! This island is downright magical, and not everyone has a chance to grace our shores. Please, come with grace, and visit us with love and respect. The Island of Maui is, as they say, No Ka Oi (The Best)! There is just so much to say about the beautiful bohemian-style Town of Paia. This “Shopper Paradise” offers way more than your eye can see! The Historical Town of Paia has deep roots in Maui’s agricultural history and is still garnished by old storefronts and relaxed beach town country vibes. Once the Counter Culture Revolution of the 1960s left San Francisco, there’s no doubt that the real deal hippies set sail for Maui. Creating new businesses and adding their flare, Paia Town then became influenced by a whole new demographic of artsy, educated, conscious hippy types. With the indigenous local surf culture and the wave of windsurfing migrants during the 1980s, Paia became known as a secret gem for all kinds of fun-loving internationals that just wanted to kick back and enjoy their lives to the fullest! Today, Paia Town is still the backseat heartbeat of Maui County, a one-stoplight town that might just be responsible for all the unforeseen trends that are at any given time throughout the Hawaiian Islands. We love Paia Town so much! From the surf shops to the galleries, yoga studios, one-of-a-kind boutiques, the Paia Tattoo Gallery, coffee shops, restaurants, and the ideal health food store in the world (Mana Foods), Paia is the epitome of Hawaii small town charm. Next time you’re on the island, do not miss out on a chance to visit Paia, Maui’s secret crowned jewel. Since 1981, the Maui Swap Meet in Kahului has been the largest of its kind on the Valley Isle. We love this market for many reasons, but it’s best noted for a variety of souvenirs and gifts. You can find all the kitschy Hawaiian style souvenirs that you want to bring back for friends and family, such as keychains, coconut postcards, false flowers for your hair, etc., but that is not the extent of goods you’ll find! One of the things that make this market so remarkable is that you’ll also find local vendors that make unique Maui-made gifts — locally-made jewelry, art, crafts, plants, and packaged foods. Another great thing about this Maui shopping market is that you can also find a wide variety of Maui grown produce, fresh flowers, food vendors, and sample tastings of locally grown foods. When visiting the Kahului Swap Meet, we suggest that you arrive early to beat the mid-morning parking traffic and the midday Central Maui heat! For more information, please visit the Swap Meet in Kahului. Located Upcountry on the slopes of Mount Haleakala is Maui’s famed cowboy country! Since the days when Spanish and Portuguese settlers laid their roots on Maui, Makawao has become a town known for its paniolo (Spanish cowboy) nature. Without a doubt, Makawao is the most charming and laid back community on Maui. In Makawao Town, guests will find an array of boutiques, galleries, restaurants and healing centers. Just 10 minutes up Baldwin Avenue from the Historic Town of Paia, Makawao is the perfect place to spend a few fun hours shopping, photographing, eating and talking story with local business owners. If you’re visiting Makawao on a Wednesday, definitely check out the weekly Farmers Market (9am-1pm) at the Po’okela Church up Olinda Road. 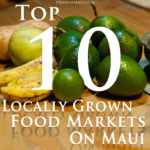 Here, you’ll find 100% local Maui produce and gift vendors. If you’re visiting Maui during the Summer, do not miss out on a chance to check out their annual 4th of July Parade and Rodeo. This is an excellent chance to engage with Maui’s Upcountry culture. For more information, please visit Makawao Town. Just 6 miles before Hana Town, approximately at Mile Marker 29, you’ll find the Nahiku Marketplace. Over the past eight years or so, the Nahiku Marketplace has transitioned from a few local vendors to a mini village of tropical fun. This is a great place to stop en route to Hana and grab a bite to eat, fresh coconut water and juices, a coffee, or find some locally made souvenirs. At Nahiku Marketplace, guests can find a surplus of locally made gifts, including shell and semiprecious stone jewelry, spiritual icons, woven goods, wood-works, glass art, surf art, rare home design elements, paintings and more. This is a must stop on the road to Hana, you’ll never know what you’ll find here! For more information, please visit Nahiku Marketplace. On Maui’s South Shore, visitors will love the location of The Shops at Wailea. Situated in the heart of one of Maui’s most luxurious resort communities, this is the perfect place to shop in paradise for all your souvenir needs. This beautiful open-air, two-story mall is home to more than seventy diverse boutiques, galleries, shops, and restaurants. Shops at Wailea offers a variety of selections ranging from mid to high-end souvenirs. Guests will find popular brands such as Gucci, Tiffany & Co. and The Gap, as well as island-style favorites like Blue Ginger and Tommy Bahama. Also, Canyon Beachwear, Honolua Surf Co. and Billabong are great places to pick up board shorts, bikinis, and Hawaii beach attire. Shops at Wailea also has one of the nicest and largest ABC’s Stores on Maui. This is the ideal place to pick up all of your sundries, aloha gift baskets, and Maui souvenirs. You and your family will enjoy strolling through this impressive mall, visiting its many boutiques and fantastic art galleries. They also present free entertainment such as a Polynesian show with hula dancers accompanied by traditional Hawaiian music. Free parking is available with minimum purchase, making the Shops at Wailea a convenient stop for buying holiday gifts on Maui. For more information, please visit The Shops at Wailea. The Artists’ Showcase at the Four Seasons Resort in Wailea is one of the most fabulous and intimate art discoveries on Maui. Glance over local artist vendors while strolling through an ocean breeze-filled resort walkway. The Artists’ Showcase takes place every day between 8:30 am-1:30 pm. If you’re in Wailea for the day, do not miss out on this luxurious and tropical art extravaganza. Featured local art includes hand-painted silks by textile artist Brenda Kennerly, contemporary female form paintings by Lori Koprowski, Hawaiian wood sculptures by Arthur Dennis Williams, ocean photography by the fabulous Cesere Brothers (they also have a gallery in Paia), amazing tropical oil paintings by the beautiful Anna Keay, island-inspired ceramics by Curt Stevens, unique Maui-made jewelry by Kathy U’u, and much more. For more information, please visit the Artists’ Showcase. Front Street in West Maui’s Lahaina Town is totally the epicenter for Maui souvenir shopping! Here, you can find it all! From rare art pieces to one-of-a-kind clothing designs and the usual Hawaii crafts, Front Street has it all. Our favorite thing about Front Street is that it’s one of the richest historical locations on Maui, full of adventurous activities with a direct Pacific Ocean view! When planning a time to check out Front Street in Lahaina, you should plan for a whole day excursion. Plan a whale watch or snorkel in the morning, grab lunch at a wonderful restaurant with an ocean view, and just stroll around Front Street going from business to business all afternoon. Here, you can stop for shave ice, coffee, and a cocktail, snacks, and check out local events. 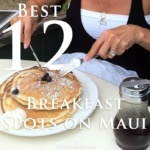 There’s also an abundance of wonderful Maui dinner restaurants on Front Street, so it’s a one-stop kind of a town. We suggest that you check out all the local art under the Banyan Tree on the weekends, and make sure to check out the fun surf shops and local art galleries (You have to check out Kai Pua!). There are just so many treasures to be found on Front Street! Fore more information, please visit Lahaina Town. Kalama Village Shopping Center is located on South Kihei Road in front of Kamaole Beach. The actual address is 1941 South Kihei Road, but you’d have better luck if you just look for Kihei Caffe or Local Boy Shave Ice from the road. There is plenty of parking behind Kalama Village, or you can find run-off parking across the street in the strip mall where Foodland is located. Kalama Village offers guests more than 40 specialty shops and over 12 restaurants and bars. This locale is the easiest place to go to find souvenirs on Maui. Most of the village is shaded, and there’s something for everyone tucked into all the nooks and crannies. Are you shopping with a family member who’d instead be watching a football or baseball game? No worries! There’s plenty of sports bars nearby. Depending on what time of day you are visiting Kalama Village, guests can find live music, karaoke or local arts and crafts demonstrations. This is a great place to check out if you want to grab all your gifts at once! It is possible to go to Kalama Village and grab earrings for your sister, coffee for your dad, t-shirts for your cousins, shave ice for your kids, clothes, and lingerie for you (visit Mahina and the Love Shack), and a couple of beers for your husband (while he’s waiting for you at the South Shore Tiki Lounge). Just sayin’. For more information, please visit Kalama Village. At Whalers Village in Ka’anapali, guests can enjoy the beach and shopping all in one day! Whalers Village is pretty amazing because it’s a) indoor/outdoor, b) steps from the sand, and c) close to a myriad of dining and leisure options. If you’re traveling with a large group, Whalers is perfect because not only is the beach just steps away, but there are always a bunch of activities going on. Find the time to shop on your own and grab everything you need knowing that your family is wholly entertained. If you don’t think you’ll have time to make it to a luau , but you really want your kids to see a traditional hula performance and have a chance to make their flower lei, this is your stop! Whalers Village also offers a myriad of shopping experiences, from local kiosk vendors to Louis Vuitton, plus a variety of daily and weekly activities. For more information, please visit Whalers Village. If you happen to find yourself looking for a place to eat after adventuring through Iao Valley, or if you’re just cruising around Central Maui, definitely make a worthy pit stop in Wailuku Town. Here, you can see old colonial architecture, Maui County’s downtown buildings, and check out Main Street. Main Street is super cool because it’s like a hodge-podge of what’s happening on Maui. Here, you can find vintage clothing, tattoo shops, a variety of super cool pawn shops, rare boutiques, music stores, yoga studios, farmers markets, art galleries, and random boutiques. When in Wailuku, definitely check out Request Music to grab some local music and rare finds, grab a coffee and lunch from Wailuku Coffee Company, check out Maui Thing for local clothing designs, Native Intelligence for Hawaiian crafts and education, Perfection Bra Fitting (for bras and lingerie), and Paradise Pawn Shop for rare and historical Maui treasures. The vibe in Wailuku is continually evolving. It’s one of those kinds of places with a multitude of hidden gems worth discovering and exploring, so check it out! 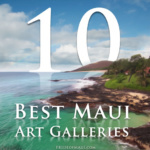 Mahalo Nui Loa (thank you so much) for reading Pride of Maui’s 10 Best Places To Buy Souvenirs On Maui! Where are your favorite places to buy gifts on Maui? Please share this article with your family and friends! From all of us at Pride of Maui, Kipa hou mai (Please visit us again)!